Discussion in 'Pasture, Hay, & Forages: Information & Management' started by MomtherOfDragons, Apr 13, 2019. Mostly a horse question.. South central texas area..
We have 38 acres, the front 6ish are fenced off and mostly cleaned up. Some weeds, lots of blue bonnets and knee (or higher) length grass. We have not had large animals on it for several years, but it was used for cattle before. We do have goats we have started rotating with electric netting but thats very small portions at a time..
My question is this (and I cant seem to get a good answer)... We have our horses at another pasture nearby that is mostly eaten down, we want to move them to our property, but we wanted to mow first to try to prevent them from colicing or foundering, but I’m finding advice saying to let them out on a fenced portion of the tall grass because it’s less rich. We can section them to small paddocks with electric tape but we dont have a barn to put them in to take them fully off the pasture for “breaks”. Would this cause them harm? To just put the 4 of them out on a couple acres and rotate when they eat it down? Or is there a possibility it could harm them for it to be tall? It’s native grass, but I’m not entirely sure what kind. Our horses have been out on pasture for years, not grain fed at all. Im sorry if this is a dumb question or if I’m over thinking this, we used to stall our show horses and had so many medical issues over the years when we were more hands on that I’m weary of making changes. I don't think I would put them (or any other livestock) onto new growth after mowing. It's generally new lush growth (especially after stressing) that causes tetany...high in K..very low in Mg, which is an extremely dangerous situation..and, mowing it and leaving the cuttings doesn't mean or ensure the dead mowed cuttings are safe either. Mowing, encourages new lush growth this time of year, and I'd be more concerned with tetany than colic. Everyone here with horses and cattle have already switched to HiMag mineral. Excess Mg is excreted out in the urine so it's difficult to over feed Mg. BUT, you need to consult with people in your own general area, as the native forages growing near RT will be completely different than what East Texas has. Identify what the predominant forage is in your pasture and consult with local horsemen and vets before making a decision. Mini Horses and MomtherOfDragons like this. One year it took almost three months before it was safe to let her out on it full time. Take your time introducing them to a new pasture. If you can section it off or put them in a dry lot, or an area that isnt too rich, do that. Hope this helps. Mini Horses, B&B Happy goats and MomtherOfDragons like this. We dont have anywhere we can section them that doesnt have grass. We could section them to a very small area though. I would advice caution as well. My vet told me and I believe I did a little reading on it as well that it is better to let horses out on grass at night. The chemicals that cause problems are not as active in the dark vs the sun during the day. I had a horse that foundered and ever since then, he and the others are in their stalls during the day and out at night. I rotate my pastures each year. I have a small sacrificial area around my barn that I contain my horses during the winter when I am feeding them hay anyway. I let my two other small pastures "rest" for the fall, winter, and part of spring. I have not let them out on it yet this year. I don't have much ground so this is really the only way to let me pastures rejuvenate is to sacrifice one area which is just about dirt at this point. 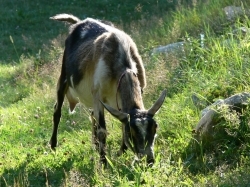 When I do let them on the pastures, the grass has usually been mowed at least once. Besides letting them out only at night, my one problem horse uses a muzzle to reduce the amount of green grass he can eat. I keep his muzzle on pretty much through the spring just to be extra cautious. I agree with others that it would be a good idea to build them up slowly, but if that is not an option, a muzzle might help too. MomtherOfDragons, Rammy and Baymule like this. We talked about going to muzzle route, it sounds like that’s probably our only option.